Galup Panettone with gianduja: a variation of the classic Christmas dessert no sweet tooth will be able to resist. 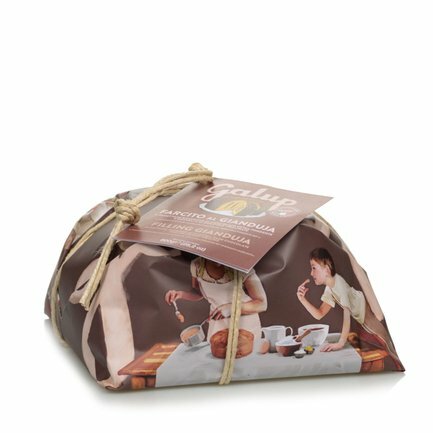 The traditional Galup Panettone recipe with soft and fragrant dough is enhanced with a gianduja cream filling, then completely covered with dark chocolate and chopped Piedmont PGI hazelnuts. The perfect dessert or gift. Ingredients Flour wheat soft type "0", eggs fresh of category A, butter, sugar, emulsifiers: mono and diglycerides of fatty acids, yeast natural (flour wheat type "0", water), orange fruit paste (glucose syrup / fructose, orange peel, sucrose, natural flavorings, acidifying citric acid), milk fresh whole, cocoa butter, salt, brewer's yeast, flavorings. 25% FILLING CREAM (Gianduja): glucose syrup, water, sugar, dextrose, hazelnut paste 4.5%, low-fat cocoa powder, milk skimmed powder, fat vegetable (sunflower, coconut, cocoa butter), ethyl alcohol 1.5%, gelling agent: pectin, preservative: potassium sorbate, flavorings. 15% COVER CHOCOLATE: cocoa paste, sugar, cocoa butter, milk anhydrous fat, emulsifier: soy lecithin, natural vanilla flavor. FILLED WITH GRAIN OF PRALINED HAZELNUT 5%: sugar, hazelnut Piedmont IGP 40%, rice starch, maltodextrin, thickener: gum arabic, coating agent: carnauba wax, flavorings. May contain traces of other nuts in shell. For more information on product labels, please contact our Customer Service department. The information on the labels of the products may vary for reasons beyond our control, therefore, there may be discrepancies between the information on the site and that on the products delivered. Please always check the information on the product before consumption or use.